The Walking Dead Recap: And Justice for All? There’s a classic scene in This Is Spinal Tap where the band — late in its career, with dwindling interest from its fans — decides to leave its heavy-metal sound behind in favor of free-form jazz. “We hope you enjoy our new direction,” says David St. Hubbins to a nearly empty amusement-park theater. I was a little concerned that this season of TWD was headed into its “Jazz Odyssey” phase with its emphasis on society (and bridge) building over zombie mayhem and cartoonish human villainy. But this episode is cause for hope that the show can tell compelling stories and build suspense without suffocating in talk of trade routes and infrastructure projects. It’s also the conclusion of a murder-mystery triptych involving the missing Saviors — essentially Law & Order: Undead Victims Unit. Once again, much of the drama comes from the growing philosophical divide between Rick and Maggie. Lest you feel unclear as to Rick’s motivation, he wakes up in the morning, says a quiet good-bye to his family, and — like a football player slapping a motivational sign on the way to the field — taps the piece of his porch that hangs on his wall, the one with Carl and Judith’s blue handprints. Maggie, on the other hand, is constantly reminded that the thug who murdered her husband is alive and many of his followers are still total scuzzbuckets. Take Billy Walsh — er, Jed — who’s in search of Justin, his MIA buddy. Jed stops Maggie’s carriage, gets all mouthy, and has the nerve to eat a tomato without permission. Buff Glenn, a.k.a. Kal from Hilltop, sums up their current mood well: “I can’t believe we’re working with these assholes.” To review: Rick gets family fun days with Judith and tells Michonne he’s ready for a different kind of future building (a.k.a., let’s get to baby makin’!). Maggie is raising a child alone, dodging drunk assassins, and trying to fuel up a goddamn tractor. Hard to blame her for being angry. This grim scenario gets even darker as Cyndie tells Erat to repeat what she said before she murdered her 11-year-old brother: “No exceptions.” Maggie and Daryl hear that, exchange a knowing glance, then simply walk away. Erat pleads for their help and swears she’s changed. Then Cyndie straight up spears her in the back of the head. 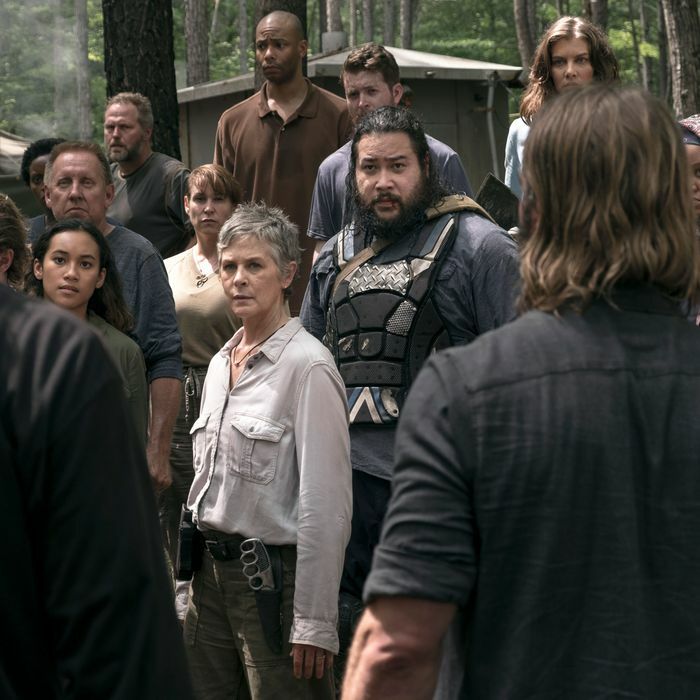 That scene was by far the most intense of the season, with long-lasting ramifications that go well beyond the Saviors walking off the job site. Now the fissure among the survivors has become a chasm. Come sunup, with no sign of Erat, the Saviors head home, step on a perfectly good tomato, and give Rick a total F-you look. Meanwhile, Maggie tells Daryl that Cyndie showed her the way — and it’s time to visit Negan. Daryl nods in agreement and the two walk down the road with their fuel and a new direction that seems less free-form jazz and more death metal. That unfinished bridge will soon be the least of Rick’s worries.